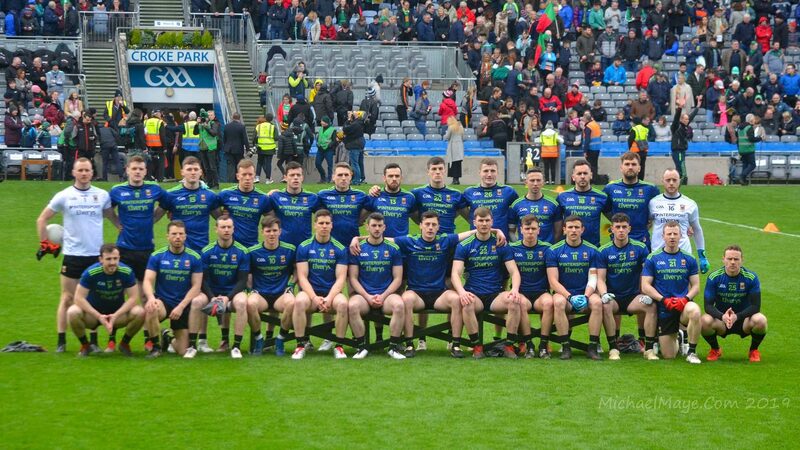 Yesterday’s National Football League final win will live long in the memory and central to this was the performances we saw from several Mayo players at Croke Park. In truth, it was very much a team display – as the saying goes, there’s no ‘i’ in team – by the lads yesterday. For example, although none of them featured in the top five in the poll, I thought the shifts put in by the likes of Lee Keegan, Keith Higgins, Paddy Durcan and Chris Barrett were all exemplary. So too was James Carr’s sparkling debut, garlanded by two sumptuous points just after the break, while Brendan Harrison never shirked in his battle with Kerry’s David Clifford. The top five vote-getters in the poll, however, all put in seriously good performances yesterday. Fergal Boland (5% of the vote) drove us forward repeatedly, ran all day and linked the play really well. Robbie Hennelly (11%) was wonderful between the sticks, rising from his goal-line several times to claim high balls, restarting the play with confidence and pulling off a goal-denying miracle save right at the death. Matthew Ruane (14%) took the fight to Kerry from the middle and, for the second time in three weeks, Mattie charged through the heart of their backline to bag a crucial three-pointer. His midfielder partner, Aidan O’Shea (20%), was an immense presence, tackling hard, turning over ball and launching attack after attack with a number of sublime passes. But the player you’ve voted for ahead of everyone else was team captain Diarmuid O’Connor (30%). His contribution to our comeback win was enormous and the 1-2 he bagged himself did much to turn the tide in our favour. He’s our MOTM from yesterday’s game. Well done to Diarmuid on his award and congrats too to all the team who worked so hard and to such effect to seal the deal for us in yesterday’s big match. Bang on WJ – there were so many of our lads right at the pitch of the game yesterday. I was sceptical about Chrissy picking up Walsh but we really marshaled him very well. Kieth repeatedly drove out of the defence and gave our wingbacks an overlap. Paddy’s point in the first half settled us and was some hit from distance. Diarmuid was quiet in the first half but just thundered into the game when we really needed to gather some momentum. It’s just so great to see the likes of Mattie Ruane, James Carr and Fergie Boland to take to that stage with such aplomb. I thought Darren Coen was more than adequate too and was a good link man. If we can spring the likes of Andy and Boyler to see games out it makes us very formidable. One final thought – Aidan O’Shea has been extremely consistent for us for a while now but the last few games have been exceptional. Since he moved back to midfield he’s dominating games and is driving this team. Pleasure to watch him play ball. Spot on, great team performance. I think settling on the midfield pairing of Ruane and Aidan O’Shea has really given the team a new impetus. Great to see so many young lads getting game time and playing well in the whole league campaign, real strength in depth being developed and still a few to come back. Spot on Rock ..rock on Diarmuid… congrats to all and especially Diarmuid on his gut bursting display. I love this team and getting excited to see young enthusiastic and gifted young blood being blended in. Exciting times but feet on the ground. Good on you Mayo… keep it up! Captain’s performance from DOC, well done. Thought he spoke very well in his acceptance speech too! Well done to Diarmuid. A great display and a great team display from every player yesyerday. I hope you enjoyed going up them steps because we’re sending you up again later in the year. Great to see young Boland well up there too……Two years ago I thought he was a bit of a lightweight but he’s really developing into a fine confident forward…….great to see it. Deservedly MOTM, he had a quiet 1st half, his yellow card (harsh) in the 6th minute curtailed him. Also his marker got a goal on him. But in the 2nd half he soared and the whole team lifted. 2 massive long range points. 3rd just fell short. Goal was taken very well. He’s a commanding presence and grows in stature. We were a totally different team in 2nd half. It’s like the first half was containment and then the 3rd and 4th quarter was us back doing what we do best. Play with massive intensity. JH used for call the 3rd quarter the “championship quarter” it really was. Far from the finished article but superb to get the win. Great win – Mayo were the better team by a bit on the day. Great to see such composure from the new players brought in. They have level heads, and are obviously being coached well. Even though I voted for Aido, I think DOC is a worthy winner, with his scores at vital times. re watched the match and Keegan had some game too, handled so much ball and so well, made dummy runs and took O’Shea out of the game, thus removing the main fulcrum of Kerry’s attack…and he is not near peak fitness yet! But DOC was immense and worked back so well too. DIarmuid MOTM, and deservedly so. AOS man of the league though imo, he was excellent throughout, back to his best. Well done to Diarmuid Great second half especially weighing in with a brilliant 1 2 for good measure. I voted for AOS Thought he was brilliant throughout. But the guy I was most delighted about was Leeroy He looked back to his old self. In the past he was asked to do jobs on danger men like Quinlivan Smith, Kavanagh, Connolly, Kilkenny etc and he totally negated and often even outscored them in the process. Sunday he was given the task of quietening S O Shea, the star of Kerry during the league. Sure enough he held him scoreless from play and completely limited his influence on the game. 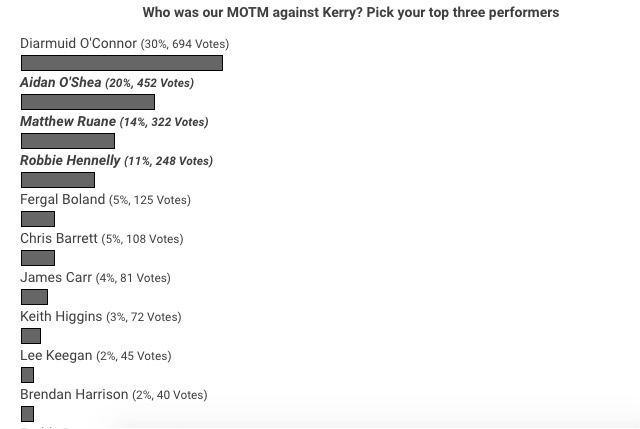 The fact that Kerry people were venting their fury at Keegan on their gaa forums shows what a super job he did. So many positives to take forward heading in to the championship but Connaught unlike Munster and Leinster will be a battlefield. Anyone who was lucky enough to witness Diarmuid’s display in Tullamore in the 2016 semi final knew we had a star in the making. Aiden O’Shea was lording it at midfield, straight after the first yellow card he called the next kick out down on himself and won it, a real sign of a confidence and dominance. I was behind the goals in the canal end and watched Walsh and Barrett match up, Walsh was the best part of a foot taller, yet Barrett out jumped and out muscled him. Some fantastic displays all round. i don’t think the Kerry lads are in any position to complain about Keegan, their boy marking McLoughlin (was it Sherwood) had a fistful of Kevin’s jersey for most of the game. Well done Diarmuid and all of the team. Keep loving your football. Does anyone else think Diarmuid is a ringer for Sean Flanagan…. What tactical changes were made at haft time? Did Mayo start playing a more long ball game like they did against Monaghan in previous game? IMO they reverted to old style (7 years of practice) in first half i.e. backs carrying the ball as far forward as possible with hand passes. Not very productive and makes it difficult for Mayo forwards thrive, and typically a back ends up in a scoring position, runs into a cul de sac, passes to someone in a worse position or mis-fires. Any comments? Willie Joe, excellent summary of the performances. I would add just one part to your sentence on Aidan that went: ‘launching attack after attack’. The addition? ‘with a number of sublime passes’. I agree Pat. Didn’t notice until you said it. See Dermot in him too. Well done Diarmuid, a great 2nd half performance. We needed players to stand up and show leadership, he certainly did that. Easy to see why he was entrusted with the captaincy when he leads by example in that way. I actually went for AOS as the man of the match, he was a colossus for the whole game. He bossed the young Kerry bucks, they couldn’t handle his pure physicality. Catcol – agree 100%. So much so that I’ve now included your suggested addition in the piece. Tactics – there was a move to push up more on Kerry’s kickouts – their 2 goals came from short Kerry kickouts I believe. Will be interesting to see what the Dontfoul blog comes up with as well as any analysis that Rob Carroll does in terms of analysis. Just to add hearty congrats to everyone players, panel, management and of course our wonderful support base. In reply to your question Tactics, one of the big influences on Sundays game was the breeze. It may not have been obvious on telly, but there was a gusty breeze coming over the hill end. It is no surprise that all 5 goals were scored in the canal end. With Kerry’s strong full forward line aerial threat and the manner in which they drove the ball into those men, the forward was always favoured that little bit more with the high ball and long ball arriving much swifter. Our full back line did a decent job in the first half but in the second when Kerry on occasion launched the ball to Walsh and Clifford, it hung in the breeze a fraction longer allowing our shorter in height defenders that second to take a yard of jumping space and break ball away. I think in first half our lads read the conditions and would have factored it into our game not to launch that difficult type ball into the full forward line and so there was a slower build up. Its not the easiest to watch sometimes but was effective enough and along with pre-game management plans best known to the inner circle, I think it was an effective enough first half. We did extremely well shooting at the canal end in second half but it was probably the more error ridden half from Mayo. Bottom line though was what a day for us, so big thank-you to all concerned. Great podcast as well WJ, seriously well put together is such a tight time frame. Dare I say DOC is possibly has the look of a young Ciaran mc Donald. Same never give up attitude. Quiet and so skilful. With points from miles out. I thought he would be something in 2016 and backed him for young player of the year back then with seniors. Glad to see him stepping up to the plate. Did Ciaran Treacy every play minor or u21 for Mayo? I have to admit I was really despondent after the Dublin game. I couldn’t understand why we were so good against Tyrone and yet got hammered by Dublin. At the time the only explanation I could offer was that the Dubs targeted us as their main threat in 2019 and set about this game with real intent to put us back in our box. Maybe that was the case or maybe we were simply awful on the night for some reason or other. The thing is we can be brilliant at times as we were during long periods in the second half on Sunday and we can go through patches where we are just very ordinary. I found myself very frustrated for long periods on Sunday because we were clearly good enough to win but we couldn’t shake them off and drive on to a comfortable victory. The uncomfortable truth is that they could have beaten us in injury time, but for a great save by Robbie Hennelly, despite us being a better team! That’s the challenge now for JH and the team – to ensure that superiority throughout the field and a huge % of possession is reflected on the scoreboard. If we can crack that puzzle we will be hard to stop. Congrats Diarmuid! So many individual performances but AOS was immense and has been one of the biggest improvements on team performance. His tackling and turnovers are adrenaline rushes. Same with Barrett. May the twin towers idea Rest In Peace! DOC was excellent in the second half and can easily see why he got MOTM with them the crucial scores but he was also largely anonymous in the first half. Id personally have given it Barrett who I thought was excellent throughout. I’ve still no idea how he physically outmuscled Walsh and beat him in the air! Folks – I think we have a serious panel now – plus SOS yet to come back. And there’s another I had cause to remember over the weekend – Ryan O’Donoghue – does anyone know if he’s in with a chance of being fit this summer ? I never buy the papers but I looked at the Irish Independent today in O Briens Cafe, saw a piece re Mayo in the Sports Section by a guy named Keys, he is probably a Dub and has started the Psychological war. He reckons that Mayo have’nt a hope of beating the Dubs in the championship, after reading it, I am now wondering whether some of the Dublin based media were surprised by Mayo’s win over over last Sunday and are actually fearful of Mayo. Here are the Mayo 88 negatives re Mayo in 2019. 1, Still concede too many goals. 2, Let teams back into games late on. 3, Alot of space in front of the fullback line for fast forwards to exploit. 5, I’m still wondering about the league match v the Dubs, was it thrown, were they in the middle of a hard training slog, was it the sight of the Sky blue jerseys that beat them in 3 finals or had they simply no answer ?. 1, Finally have great subs / panel to make a huge difference in a tight game. 2, I like the look of the new / young guys, all tall / rangy and powerful. 3, Experience in buckets from the older guys. 4, Aidan O Shea, looks much fitter now, even covering back in the defence and stripping the ball from the opposition. 5, One or two of the young guys, best players in the league for 2019. 6, Did’nt rely too much on the new rules for the league that will be dropped for the championship ( Tyrone did put alot of emphasis on the mark, the Dubs did’nt really apply the new rules ). 7, More pace in the full forward line than the past 3 years. 8, Have the best record of knocking out the All Ireland final winners of the past 20 years in Quarter or Semi finals. 9, A fresh approach since Horan has come in. 10, The Dubs have’nt brought any young / top players into the 2019 scene. 11, When Treacy was one on one with the goalie he went for a goal to put the game to bed, other seasoned guys may have taken the safe option of punching it over the bar and settled for only a point. This crack of containment of the opposition won’t win an All Ireland, ie, playing to their strengths / over analising the opposition players. I remember reading something on Google a month ago where Senan Connell was pointing out the fact that Horan would have gained a huge amount of knowledge from covering the games on Sky. Can somebody answer those two queries. 1, Is the dark blue and green jersey the official 2019 jersey. 2, Where is Ardagh, must be a newish club, was’nt around in the 1980’s or early 1990’s. Ardagh is in Nth Mayo (boxed in kinda between Ballina, Crossmolina, Moygownagh, etc. )…..around a long time but like Moygownagh beside it and other local ones like Kilfian, Ballycastle, etc. a pretty small rural junior club. Great part of the world! Congrats to Diarmuid, a real captains performance, reminiscent of Roy Keane in Turin in 1999. So happy to see him lifting that cup in croker after his efforts in Newbridge. He was prepared to die for the cause that day, and the image of him hobbling one legged towards the ball in injury time, is etched in my mind. Roscommon/Leitrim is the big one for us now. If it was in Carrick id say Leitrim have a good chance, but the Hyde should see the rossies through. They’ll have no pressure on them so we need to be ready, and hit them hard early. They tend to crumble when the heat comes on. If we get through that game, we’ll be 70 mins away from the super 8’s. Above all years, a loss against Galway wouldnt be as catastrophic as it was the last 3 yrs. we’d only have one qualifier to play to make the supers, that should take some of the pressure of us??. Either way, it would be great achievment to win back Connacht. But need to put the heads down now and focus on the rossies. Mayo88, to me it sounds like Keys is doing us a favour, thats exactly the kind of spiel you’d want to be seeing. Suits us (and the rest) perfectly. The Dubs will stroll to the 5 in a row, then Gavin will say bye bye along with 2 or 3 elder statesmen. The Dubs will be in a bit of bother then. Mayo88, your problems began when you started reading that paper. Sure epitaphs were written for many of this team, starting in 2014. Let them at it. Do all 34 players who played in the league this year receive a league medal? or is it just the 26 named for final which included 2 players slingerman and conor oshea who didn’t play at all this year? A few others didn’t play this year either like Doyle, McLaughlin, Hanley, Horan. So do all 40 receive league medals? Ardagh is north west Mayo outside Ballina – on the Crossmolina side – kind of between Ballina and Crossmolina and touching Moygownagh (but if you don’t know Ardagh you won’t know Moygownagh!). Not a new club but disbanded a few times between the 40’s and 70’s and sometimes joined forces with adjoining parish to be called Ardmoy but last decade are just their own parish again. Mayo88. Ardagh is between Ballina and Crossmolina. It was around in the 80’s and 90’s and long before then I would bet. I believe Sean Lowry played with them for a spell back in the 80’s. That’s my recollection anyway. And Colm Keys annoyed me too esp after me just telling a friend yesterday that I normally enjoy his pieces!!! I’d like more positivity for a few days. I wish I hadn’t read him but we are used to this talk. Good stuff Sinead37. You have more detail than me. He surely knows moygownagh that gave us Anthony Finnerty and Pat holmes although I think Pat transferred to play with Castlebar as did John Maughan who is a crossmolina man. The Keys piece put a bit of a dampener on the good feelings from Sunday for me only for 15 seconds. As far as I remember he is one of the more reasonable and respectful writers with that otherwise questionable sports section. I also feel he might have been doing Mayo a favour. A lot of people would like to see the Dubs meet a real challenge and we might be in the running to offer that. Maybe he’s saying the Dubs are still way ahead of all other contenders because this is the type of level head that is needed now to prepare properly for a crack at them. If a good team prepares very seriously this is the best possible scenario for pipping the Dubs. Nothing less will do, I would think. And as for me, it is certainly within the realm of possibility. Let’s stay quiet, put the head down and, as DOC said, drive on (sprinkled with that nice little bit of conviction that floated down about the team at crucial times on Sunday). Revellino, we played them in under age competitions when I was young. Could still do but I’m out of touch. Our most valued contributor Anne Marie Flynn is from Ardagh and is not too far from Knockmore/Rathduff Parish where Me Fein Agus Mo Chlann comes from and for good measure, our Parish Priest Fr Flynn comes from there too . I’d agree that Colm Keys is a decent enough writer. It’s a shame the talents are wasted in that particular paper. While I thoroughly enjoyed our win on Sunday a dose of reality would be that it was not a performance that would win a game against the opposition we might meet in August or September. There were mistakes and there were plenty of them but the good thing is that we can work on those. The additional lift that it will give the team is no small matter and it’s not a coincidence either that the majority of scores came from the same bunch of lads that came through the minor teams of 2013 and 2014, as well as the under 21’s of 2016. We’ve been given a taste of what its like to win on a big occasion, that should be motivation enough for everyone to keep a lid on things and drive on for more of it later in the year. Loved being able to buy a paper and go online the Monday after a final that Mayo were involved in..Granted it wasnt the biggie but the feelgood factor that will permeate both team and supporters cannot be denied..How much easier will it be for lads to turn up to training knowing they are moving in the right direction..Read Colm Keys article and it was pretty much what is to be expected from the media..Accept the drive for five is inevitable and just focus on 2020..As if. Colm Keys isn’t a Dub, Mayo88, he’s from Meath and he’s a very good GAA writer. He’s also on this week’s podcast as it happens – Ed McGreal caught up with him after the match at Croke Park. We should never a problem with constructive criticism of us and I think that what he wrote falls into that category. We all know we’ve plenty of catching up to go if we’re to challenge the likes of Dublin this year, and important matches to win too before we even have the luxury of thinking about tackling the Dubs again. Backdoorsam – if you have a twitter account can you take a quick look at it?. Whether people like it or not Dublin have been the bench mark for the passed number of years and may be again this year. Time will tell. As regards clear daylight between them and the rest, I don’t remember that daylight in 2016 and 2017. They did end up with Sam but knew they had been in an all Ireland final. I would love us to approach the championship the same way we did the league. Keep developing and see where we finish up. Connacht will be tough to win. If we can win connacht we will have a good shot at an all ireland semi final. @Sinead37. After you finished with underage I hope it wasn’t up to Micky O’Boyles you went. @Joet1480 and Pearls and Longnecks and Candles ha ha ha. It’s great to visit here on the Monday evening after a final and see happy supporters. It struck me after winning, the remarkable bond that exists with the players. 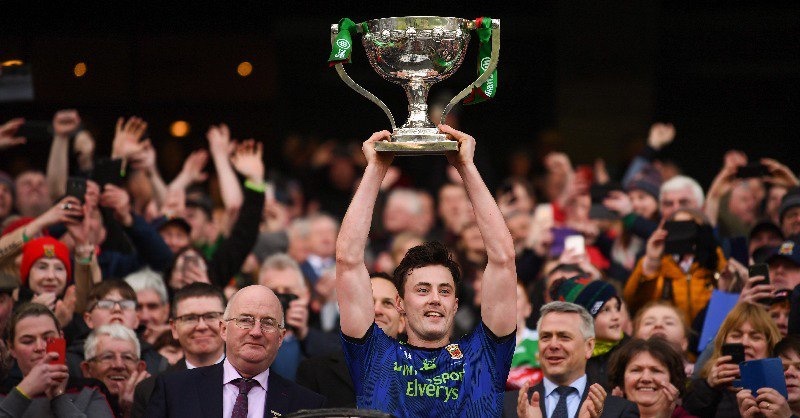 And the way Boland threw the cup in the air – great intent I would think to go all out for Sam… Every county deserves success – it lifts the spirit. I think the GAA should now think seriously of formulating championships for the weaker counties, with the prospect of promotion. As in club competitions, regardless of the grade, winning a championship gives a huge psychological lift to a county. Btw I’d like to give a shout out to our camogie team, who beat Kilkenny on Sunday. Tingles, LongNecks and Pearls …. ah great memories of the old Ballina hot-spots! But speaking of Ardagh – just outside Ballina Mayo88- we had our own hotspot – it was called “the Hut”. Many’s a young footballer strutted their stuff in the Hut in Ardagh in the early 80’s. Anyone remember? The bond between players and supporters is amazing. Loved Diarmuid’s speech and his acceptance of man of match award referencing us supporters. We always have their backs. Michael D and Martin Carney – what a combination, so funny. Talk about passion! Hope the players are enjoying a bit of down time before they go again. We have to savour these moments. Jesus, I’ve only been to or heard of longnecks in that list, I must be a young thing!! I moved between The TF, Inscene (think that was in the welcome inn), The Dolphin and LongNecks. Advantage of being from the mountains. Those were the days. Often heard of the Hut GalwayviaBallina but I was never in it. I was in Micky o’boyles a few times and the Dolphin a few thousand times. Yes Pat. I hope james Carr has a long and illustrious career. It’s great for all in the Ardagh area and surrounds to have one of their own on the Mayo team. If Mayo can win the Sam Maguire with James Carr on the team we can call it the Ardagh Chalice. DOC is one of the best footballers in the country. As a young player you could tell he was just a bit special. I dont think we’ve seen the best of him consistently over the last couple of years as I don’t think he’s always been fully fit in that period…DOC operating at 100% is a massive plus…it’s not just the ability he has, it’s the sheer amount of work he gets through in a game…who can forget his efforts against Kildare last year…immense. Speaking of fully fit…I have never seen AOS looking leaner or fitter or playing better football. I also think midfield is his best position and that’s where he should play.